Gilbert W. Collett RDP FRPSL was the first President of the British West Indies Study Circle. He was one of the editors, along with Buckland Edwards, Morton and Nicholson, of the classic "Jamaica: Its postal history, postage stamps and postmarks", published in 1928 by Stanley Gibbons Ltd., London. That volume remains relevant to collectors to this day, and is an example of great philatelic literature. Recipients of the Collett Award are selected in the tradition of such fine work. Dr I. M. Yarry (U.S.A.) – and at the AGM in March 1968 they announced that L. E. Britnor would be the first recipient of the Trophy for his Bulletin articles in 1966 and 1967. The winner's prize took the form of a small silver dish with a Tudor rose emblem. Those were good days for the Bulletin, which won a Bronze Silver Award at the BPA in November 1967. From previous editions of the Bulletin in the archive, I have been able to collate what I believe is a complete list of winners to date. They are shown in Table 1, but I would welcome any corrections or additional information. Table 1. Recipients of the Collett Memorial Trophy 1968-2011. Notes. Descriptions of publications are based on the Bulletin announcement where possible. In 1974 and 1982 Simon Goldblatt and Anthony Lewarn, respectively, were Commended for contributions to the Bulletin. Symbols. M, published as a monograph; *, BWISC publication currently available from Pennymead Books. In 1974, Leonard Britnor's book "The History of the Sailing Packets to the West Indies", published by BWISC, won the prestigious Albert H. Harris Trophy at Stampex, but of course was not eligible for the Collett. I do not know if that influenced the Circle, but the rules were changed, and in 1978 the Collett Trophy was presented for a book for the first time, Britnor's "BWI Postal Rates up to 1900". The last of the original Tudor rose trophies was awarded in 1998 to Frank Deakin. Then for several years the prize was reassessed. The Bulletin was certainly not moribund in this period, winning, for example, the inaugural ABPS specialist society journal competition in 2004. Discussions continued, and in 2006 (announced in issue 210) the prize was revived. Once more, only Bulletin articles would be eligible. Recently, Charles Freeland, Graham Booth and Michael Medlicott, have been considering how best to carry the Collett forward, and in April they made recommendations to the Committee. The new arrangements are described by the President in the article below. They promise a long and stable future for an award that celebrates some of the finest qualities of the Circle, and the best writing on BWI philately. Back in our early days, the Circle’s founding President, G W Collett, inaugurated a biennial award for the best Bulletin article and provided the funds for the purchase of a number of silver ashtrays to present to the winners. The supply of ashtrays lasted until 1998 and at that point the award lapsed. 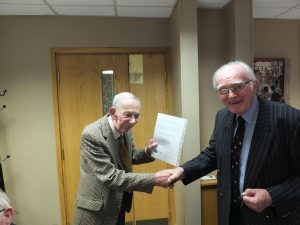 In 2007, however, the Committee decided to reinstate the award for the best bulletin article and fund it with a modest credit note for use in our annual auctions. The winners were decided by a secret ballot conducted at the Committee meeting preceding the AGM. After I was elected President, I voiced my dissatisfaction at this process since it did not entail any deep assessment of the contenders and the prize did not seem a worthy one. The Committee asked me to head a small steering group to come up with an alternative solution. I recruited two of our longstanding members, Graham Booth and Michael Medlicott, and our proposals as set out below were accepted by the Committee at its meeting that preceded our AGM on 27 April this year. The core of the proposal is that we inaugurate a Roll of Honour for distinguished authors of BWI–related topics to sign in an award ceremony at our biennial Conventions. Certificates will be presented to each signatory to commemorate their achievement. We felt that assessing books in competition with Bulletin articles was not a level playing field so there will be two separate pages in the scroll, one for books, study papers etc and the other for articles. The same person could be asked to sign both pages, but only once on each page, so repeat winners will not be possible. The award for Bulletin articles will be determined biennially for the article the selection committee judges as the best in the two previous years’ Bulletins. The criteria have not been fully set out but will obviously focus on the quality of the original research. An article that is substantially the same as one previously published elsewhere will not be eligible, nor one that has required substantial editorial redrafting. The jury for this award will initially consist of Simon Goldblatt, Ian Jakes and Ray Stanton, with technical advice provided by the current editor. The first two have won the award already. The Committee also asked the three members of the steering group (i.e. Graham Booth, Michael Medlicott and myself) to form the jury for the second award for outstanding books, study papers or anything else relevant to BWI philately or postal history. Note this is broadly worded to allow the selection committee the maximum flexibility, and is not confined to books that we publish or indeed to Circle members, but could be awarded for example to books on BWI topics published by the RPS. Recognising that books are published irregularly, a winner will not necessarily be selected every two years, and there may be occasions on which two or even more authors may be invited to sign the scroll. That may be inevitable if a book has co–authors or when two outstanding books have been published. All past winners of the Collett Award will be invited to attend our Convention in October and to sign the relevant page, together with this year’s winners who will be announced during the ceremony. The Committee has accepted that the juries should have the right to make the award to one of their members on condition that the process is performed in a wholly transparent manner and only when two members are unanimous that the third is clearly the best candidate. The previous living winners of the Collett Memorial Trophy were invited to sign the new Roll of Honour. 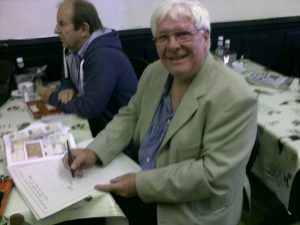 Ian Chard, Frank Deakin, and Ian Jakes had signed earlier, as they were unable to attend the Convention. 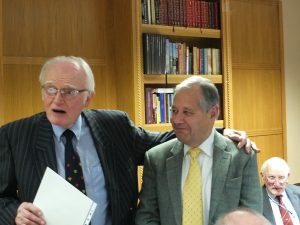 Peter Fernbank and Simon Goldblatt were present to sign, introduced by Ray Stanton. A panel of Simon Goldblatt, Ian Jakes and Ray Stanton had considered the best contribution to the Bulletin for the years 2011 and 2012. Simon announced that the winner was Charles Freeland. He praised the quality of Charles' contributions, particularly his article on Grenada Badge of the Colony issues in Bulletin 231, which satisfied all of the award's criteria regarding original research. Simon noted that the article had studied a 'set' which seemed straightforward at first glance, and revealed a depth of philatelic interest that obliged us to see it in a new light. 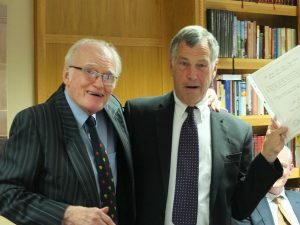 Charles Freeland, on behalf of his fellow members of the book award panel, Graham Booth and Michael Medlicott, then announced that there would be two winners of the Award in 2013 for the 'books' category: Peter Fernbank and Michael Rego. Peter said some words of thanks and praised the work of Peter Ford, who drives forward the Circle's intensive and unrivalled publication programme. 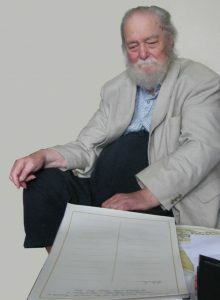 Frank Deakin after signing the Roll of Honour at his home in Exmouth, July 2013. 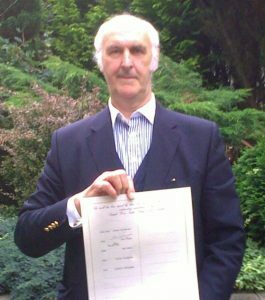 Ian Chard after signing the Roll of Honour in Broadford, Skye, September 2013.